First Minister Nicola Sturgeon has slammed the Tory Govt at Westminster after news emerged that more promises made to Clyde shipbuilders during the 2014 Indyref were to be broken. The SNP leader described news that military ships are to be put out to international tender instead of automatically coming to Scottish yards, as a “blatant betrayal”. According to the Daily Record newspaper, contract work worth £1bn is to be made available to international tenders instead of going directly to the Scottish yards. The newspaper claims thousands of jobs are now at risk as a result. Responding to a question at First Minister’s Questions, Nicola Sturgeon said: “This is work that was promised to the Clyde and this is work that very definitely should go to the Clyde. Highlighting the pledges made by Unionist parties during the independence referendum, the FM added: “Promises were made to those yards by the Tories, indeed by all the Unionist parties during the referendum. “They were told there were promises of work for years to come, and they specifically said that Scotland, if it became independent, would not be able to secure that work for the Clyde because contracts couldn’t go to ‘foreign countries’. Claims from pro-Union politicians that a newly independent Scotlnd would be blocked from being automatically awarded Royal Navy contracts featured widely during the Indyref camapign. The issue featured prominenty in BBC Scotland’s news coverage at the time. Unionists pledged billions of pounds of contracts would come to Scottish shipyards if voters rejected independence. A so-called frigate factory was also pledged with at least thirteen Type 26 frigates guaranteed. Prime Minister David Cameron pledged evem more ships when challenged on the issue in 2015. The Type 26 contract was subsequently reduced from thirteen to eight, with five Tyoe 31 frigates replacing the larger vessels. However in October last year it emerged that BAE Systems, the owners of the Govan and Scotstoun yards, had entered into an agreement with Cammell Laird. 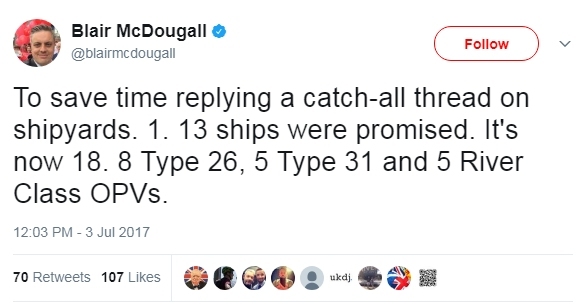 The partnership meant that the Type 31s would not be going to the Scottish yards. This latest bombshell means that currently only three Type 26 frigates are guaranteed to be built on the Clyde. There is also not going to be any frigate-factory. They have been lied to several times by now. Of all groups in Scotland they have been let down the most. The Govan yard workers should be joining their local YES group a fighting for Independence. Wonder if they also know they can stop paying ‘Union Dues’ to the BritNat Labour Party and pay them to the SNP? Cut their funding, same as we are doing to the BBC. Hope they are supporting THE ONLY Political Party that puts Scottish Jobs and Scottish Industry 1st. Think BiFAB and the Clydebridge and Dalzell steel processing mills in comparison. *It is a pity the link to the SNPTUG is expired. This is a personal bugbear of mine as The SNP should be annihilating these Red Tory Charlatan Fuckers. Would be good to have a list of all the companies/ jobs the SNP have saved with a paragraph giving pertinent info. Aye the party should work on TU links. Leonard is going to use his connections with the Unions. What does the Tory imperial English dictatorship have to do before the spineless majority of self styled Scotbuts turn like the worms that they are? Is their allegiance to Rangers fitba team or the SLAB kid on ‘workers’ party…really enough to blind them to the absolute degradation being dumped on our country day in and day out by paid traitors? Unfortunately, I’m beginning to believe it is. Maybe it will take comrade Davidson to ‘bayonet the wounded ‘before they will waken up. -None of the Clyde shipyards have or will bid for these contracts. -None of the Clyde shipyards have the capacity to build these ships. Do you lot just believe everything you read in the press? Not just the BritNat Press Tommy boy. Promises were made to the workforce and the electorate in good faith during the Independence Referendum. These have now been broken. Or are you one of those Tommies who is content to be led by donkeys? Tommy are you defending the Tory government ? and their pledge . Just asking because your 3 lines of factual information seem to indicate you have information to back these claims up , if so lets hear it and not just make a statement . Under EU Law – this would be the EU we are leaving in 2019 . None of the Clyde shipyards have or will bid – Why ? None of the Clyde shipyards have the capacity , overflowing with work are they ? Only one line makes sense the last one ,that also applies to people who post of Indy supporting websites dont believe all you read . Why are you writing to the only independence supporting paper with your unionist views. Go support the99% unionist press. Do you believe everything you read there? The value of unionist ‘pledges’ and ‘vows’ under the Great British imperial feudal system. Imagine what we could achieve if Scotland had a proper democracy of real meaning and value. But yet would these Shipbuilders vote for Independence NO. The SNP should find the money to put the Better Together poster with the quote from Henry Wilson, Shipyard Union Convener, on a great big poster right outside the front gate of BAE on the Clyde. Mr Aikenhead do you think for one minute that the foreign shipyards will be competing for these contracts without the financial support of their governments? Level playing field? What is your proof for saying that the Clyde shipyard could not build the ships? The workers were told by Better Together that in the event of a Yes vote they would not be considered as the ships could not be built by foreign yards. More lies, obviously. All relevant facts now i thepublic domain, this is fake news of the first order. Sorry to disturb your latest portion of bitter grievomax. Who could have voted the Daily Rocord newspaper of the year what Piss. FYI – Something to look forward to from the BBC in Scotland – a ‘crisis’ – broadcasting on 30 April. Watch out for Police Scotland issues/articles developing on the BBC over the next 10 days, prior to broadcast.